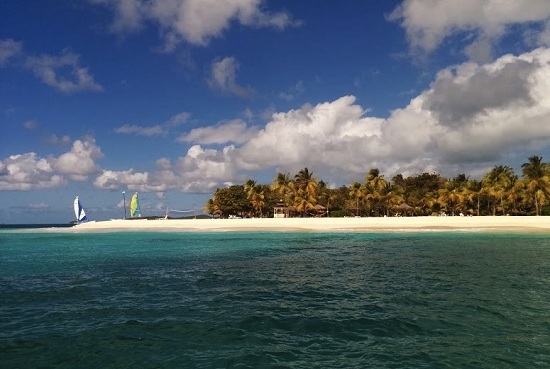 Read about a day of sailing through the Caribbean's picturesque Tobago Cays as travel blogger Jayne Gorman goes in search of sea turtles, deserted beaches and the pirate life. I spied the marine park on the airplane over and was ready to dive right in there and then. Even from the sky I could see the transparency of the crystal waters, the perfection of the sand and an abundance of coral reef surrounding the islands. 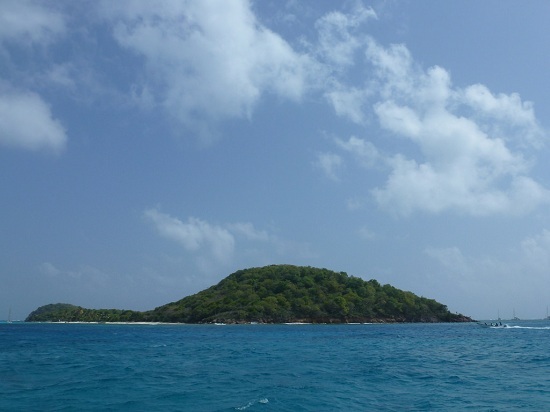 The Tobago Cays Marine Park consists of an idyllic-looking cluster of 5 uninhabited islands located to the east of Mayreau in the Southern Grenadines. 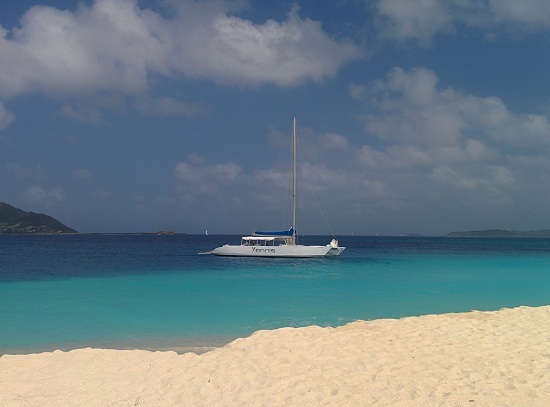 Popular with divers, watersport enthusiasts and beach-hunters (like myself), a sailing trip to the Tobago Cays is a popular day trip for visitors to this region. The Cays are also known for hosting some famous guests – namely, turtles and pirates. 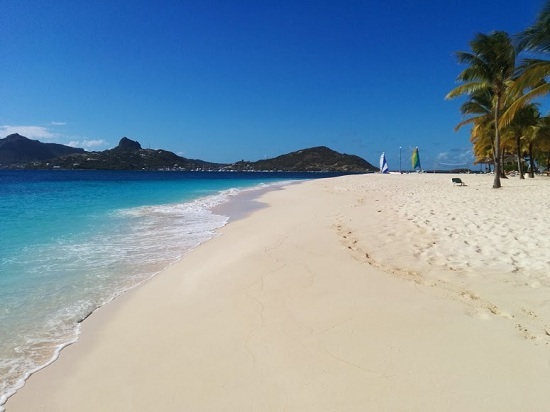 During a recent stay on Palm Island in Saint Vincent and the Grenadines I took a trip on a catamaran to meet them for myself. 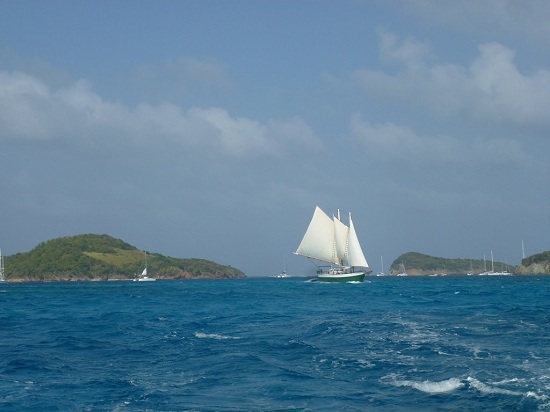 Sailing trips to the Tobago Cays can be organised from many major hotels in the Grenadines including those on St Vincent, Bequia, Mustique, Canouan and Mayreau. My boat, the Yannis, set sail from Union Island and pulled up directly on the beach at Palm Island for me to climb aboard. At Palm the crew stocked up on supplies for the day and I eyed up the bottles of rum as they piled up on the bar – it was starting to feel like a real ‘Pirates of the Caribbean’ adventure. The crew foisted the sail into position and we gently cruised away from the private Palm Island resort. Locals call this part of the Caribbean ‘sailing for beginners’ - as the islands are located fairly close together, so you can often see your next destination before you have left the first. Our first stop on this trip was already on the horizon; we would be donning our snorkels to spy on the marine life of Mayreau. The boat pulled up directly on the beach and we mask-and-flipper-donning passengers plopped into the water. The crew pointed out the best areas for us to snorkel, near the island’s rocks, but as the weather was choppy that day the visibility wasn't so good. I decided to save my energy for the dive sites I knew we still had to come and went to lie on the deserted beach until it was time to leave. For a while I was completely lost in my imagination, daydreaming of life as a stranded ‘Bloginson Crusoe’, until the strange sensation of there being someone nearby woke me up. It seemed I wasn't as alone as I thought; 2 dogs lay curled beside me, basking in the sunshine. “Now it’s time to meet the turtles,” declared the captain. Before we had even got in the water I could see the Tobago Cays' residents frolicking in the swirl. In little groups of 2 and 3 the turtles were taking it in turns to come up for air; elegant necks and Jurassic faces just peeking above the surface. Before I had time to wimp out I jumped in to say hello. 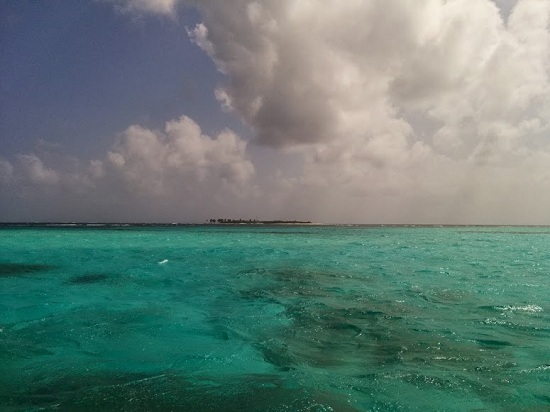 The waters in the Cays were still and clear. A buoyed area had been set up to protect the turtles but they weren't the only ones hanging out there. Keeping a respectful distance I slowly followed a group of turtles as they led me straight past a stingray, starfish and schools of fish with exceptionally long noses. A gurgled ‘wow’ escaped from my mouth and travelled through my snorkel to the surface of the water. As we headed out of the Cays the crew were proud to point out the area’s brush with celebrity. The small palm-fringed island of Petit Tabac had played host to Johnny Depp and Keira Knightley as Captain Jack Sparrow and Elizabeth Swan during filming of Pirates of the Caribbean. Those who have seen the film may remember they were marooned here until Elizabeth sets fire to a stash of rum that leads to their rescue. I'm not sure I would have done the same - I’d have been quite happy to stay stranded here, at least for a little while longer.